On-site portable storage containers have grown in popularity through the years and become a terrific choice for residential, industrial, construction, retail and business storage thanks to their versatility, convenience, security and affordability. For example, business owners use mobile storage containers for storing office furniture and supplies, client files, company records and other equipment and key documents. Contractors, too, see mobile storage units as their go-to choice for secure, on-site storage of building equipment, materials and tools. Retailers are able to eliminate the cost and hassle of renting a separate and expensive commercial warehouse space for storage of records, as well as excess and seasonal inventory, by using portable storage units. Some have even used them as physical storefronts. In terms of residential usage, homeowners like these containers for storing household items, clothing and furniture when staging, renovating or decluttering their homes. Size: When selecting a container, be sure to assess your storage needs so you can make the right choice based on your immediate and foreseeable needs. Don’t be afraid to rent more than one container up front or as your needs change or grow down the road. Quality: Going with high-quality containers that are made from heavy-gauge, weatherproof and fireproof stainless steel is the prudent choice for peace of mind. Location and Accessibility: Make sure you designate a space on site for the portable unit that’s level with enough clearance to be delivered and picked up, as well as with enough clearance to open and close the doors. The space you designate should also be easily available to all who need to access the container. Insurance: Whether it’s a long-term solution or short-term need, don’t overlook insurance. Though these containers are made from secure, heavy-gauge stainless steel, it’s a good idea to make sure everything you’re storing inside of them is, in fact, covered under the homeowners’ or corporate liability insurance you carry for your home or business, depending on where you’ll be using these containers. At A.B. 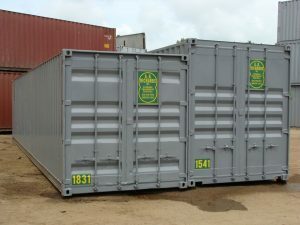 Richards we offer both renting and leasing options, and deliver 20ft, 40ft or 40ft jumbo (hi-cube) storage containers to your place of business, construction site or home, depending on your storage needs. Contact A.B. Richards, today at (800) 597-5971 to learn more about our storage container renting and leasing options. Our expert personnel will answer any questions you might have and help you pick the exact portable storage containers that work for you.